Our team of professional power washers along with the best pressure washing equipment can get things cleaned up fast and efficiently. 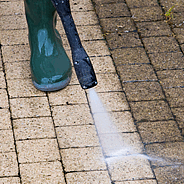 With each of the above, we use a specialized cleaning agent to get deep into the dirt and pressure wash it away. All the cleaning products we use are safe and non-toxic. See how Accurate can make your property look like new again! Have your surface look better and maintain its value..